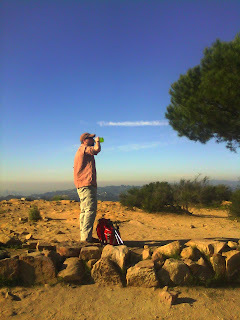 I have not been getting out much recently on the trails so I have not been posting many trip reports and have turned more toward pontificating on different attributes of hiking. Today is no different except in one respect, let's have a FUN post (managing nature, how to hike without a car, pshaw!). Drinking can be fun right? Right? But what if you are still in the hiking mood when you start to imbibe? Well combine them son, that's what I say. EWH proudly presents, drinks that are hiking related! Fitting that I start with a drink named after my home hiking area. This recipe allegedly comes from the great magazine Adirondack Life and was originally from the Waldorf Astoria Bar Book of 1939. Pour the gin into an old-fashioned glass filled with ice. Top with orange juice. I am not a huge fan of gin but the OJ cures all and while not super outdoorsy in ingredients, the name and the provenance is good enough for me. At first blush, I am wondering about the lemon juice but I think the dark amber quality of the syrup (the good stuff meaning Grade A) with Markers Mark will be a good smoky concoction on a rainy day in the cabin (in your mind since you are living in an apartment in LA). Moving across the country, we encounter Colorado and the Rocky Mountains. Those high elevations can certainly make the alcohol pack a punch and this drink will start to get you there in a hurry. shake with ice, strain into a shot glass. From Bar Man Drinks, this drink has lime and amaretto and SoCo. What is interesting is the reliance on tang or smokiness in outdoor drinks. You want a drink to remind you of the mountains? Saddle up with some pucker juice, apparently. From the always great Backpacker Magazine comes an interesting drink from their Backcountry Bartender. At home: Slice the cucumber and pick 3-6 of your best mint leaves. Put mint, cucumber, simple syrup, and rum into a zip-top bag, and then into a well-sealed wide mouthed water bottle. These ingredients should infuse for at least 24 hours, but it is not an exact science. The longer they are married, the stronger the flavors will become (think jalapeno-infused vodka-- after 3 days of infusing, just looking at it will make you eyes water). I find this drink fascinating since it is meant to be constructed while hiking (flavoring the cucumbers in a ziplock bag while hiking, cooling the bag in a cold stream). Truly, this drink is meant to be enjoyed ON the trail not just lieu of it. Bonus points for including syrup again but one has to wonder about the cucumber. Something to be tried on a trail soon! It is tough finding region specific drinks so we are into the name categories of drinks. For our consideration is Mountain Breeze which scores an impressive 9.8 out of 10 on Drinks Mixer. This drink seems to be a variation on the Long Island Iced Tea but sweeter with the cranberry and sweet and sour mix. It does have some legit mountain cred as it comes from the Switzerland Inn in the Little Switzerland Mountains in North Carolina. I have never heard of such a place but combine little (or preferably 'lil) with mountains and Switzerland then I will believe anything you say. Have any hiking-related drinks? Add em in the comments! I love your addendum about how you are in the cabin in your mind, I too am an apartment dweller in body, but in my mind I am always outdoors. Someday I will get there. But during youth I have to make some cash to enjoy later! Thanks @Miadventure! I am trying my best to turn my apartment into a cabin but my girlfriend seems to have other plans :P.
why would you mix makers with anything. If you are a real cabin dweller you better learn to drink your wiskey straight. Gotta say The Adirondack sounds disgusting though. @2lookingforward- I agree with you generally but I have to cut my booze sometimes with something, may as well be syrup. @Chris- I think you have to work up to it by drinking lots of drinks first before mixing it.